Some of the features in this program included a Table of Contents, a student journal, access to Resources including white papers, websites, and PDF documents, a searchable Glossary and full-screen DVD video. The whole program creates a blended learning solution for facilitators and one-on-one learning demonstrating many first-hand interventions with preschoolers in the real-world classroom environment. 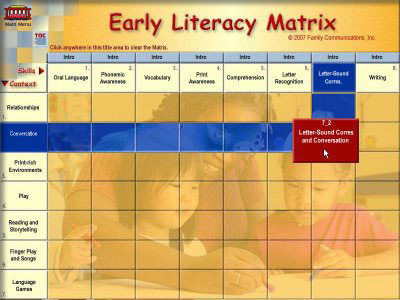 To see the relationship between the skills learned by the children and the various teaching methods to help the child obtain the literacy skills, a Matrix was developed which served the dual purpose of showing these relationships and acting as a menu system to access the learning modules in a particular skill path. The learners were to observe the interactions with children in a real classroom situation and draw conclusions based on the sample clip. The facilitator has full control over video playback in the 640 x 480 window, or with a single click, expanding the commercial DVD quality video full screen. Audio controls manage the sound levels, and the pause/play feature allows the facilitator to freeze the action while learners participated in an open a discussion about the interactions with children and the educators in the video clip. As the student teachers clicked on each of the groups of children at lunch, they heard all the various conversations between the children and with the teacher in the videos. The objective was to learn how to encourage the children to carry on a conversation with their peers and their teacher during mealtimes. 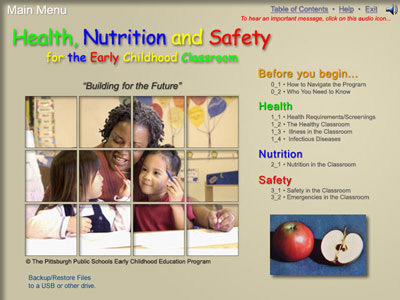 This program provides inservice training for the Early Childhood staff of the Pittsburgh Public Schools on the subjects of Health, Nutrition, and Safety. 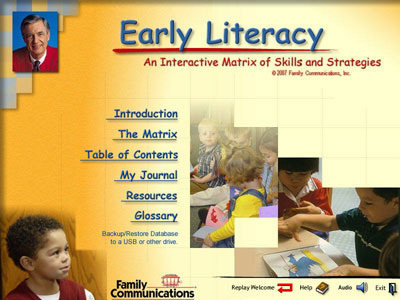 Some of the features in this program included a multi-tiered menu system, table of contents, help, resources including, access to more than 100 PDF forms used regularly in the classroom, links to Pittsburgh School's websites, a searchable Glossary, animations, interactive exercises, and quizzes. Teachers also had the capability to backup files to a USB drive. When is it a good time to wash your hands? "When her hands are dirty, of course!" 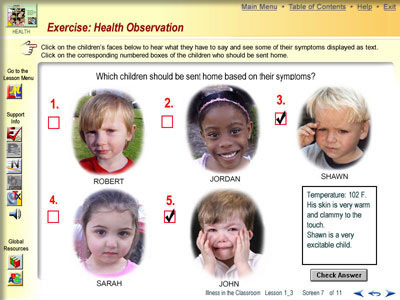 As the teacher clicks on each child's animated face, their mouth opens and conversational text is displayed in the bubble while a randomly selected audio response is heard. In this exercise, there were twelve random answers to the question. Audio was recorded by child actors. The teachers were to observe the interactions with children in a real classroom situation and draw conclusions based on the sample clip. They have full control over video playback in the 640 x 480 window, or with a single click, expanding the commercial DVD quality video full screen. 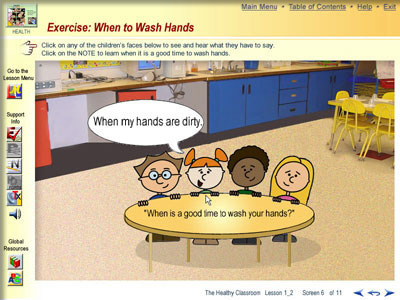 Audio controls manage the sound levels, and the pause/play feature allows the user to freeze the action while the teachers participate in an open discussion about the interactions with the children in the video clip.